Playing any sport properly to a good standard brings a whole range of benefits for a young child, and can have a massive impact on their physical and mental well-being. Many parents assume that sporting talent is innate; a genetic inheritance that enables certain children to excel, whilst their friends might struggle. However, high quality, professional coaching from a young age can help any child to reach a good, competitive standard in their chosen sport. The ability to play football well brings immense social benefits to a child, helping them to make friends, become more confident, and, once at school, give them the social status that excellence in sport brings. Learning soccer together is also a wonderful way for children and parents to bond, and creates a shared interest that will last a lifetime. A professional football training company will work from a syllabus developed out of many thousands of hours of coaching experience, and will be delivered by enthusiastic, skilled, goal focused coaches, who love the game, and understand how best to enthuse and instruct a young group of players. Simply having FUN. A chance to forget about some of the things they might not enjoy in life, and revel in the feeling of being good at something, and thoroughly involved in the enjoyment of the moment . A broader outlook on life, with an ability to mix with other children, and to appreciate the importance of hard work in pursuit of a team goal. Less time spent on the computer or Playsation; more time spent interacting with their peers. Learning to listen and follow instructions. A growing understanding that hard work and practice can help them to achieve goals that bring benefit to their lives. A realisation that failure is not to be feared, and that embracing your mistakes, learning from them, and moving forward, is the key to success in every sphere of life. 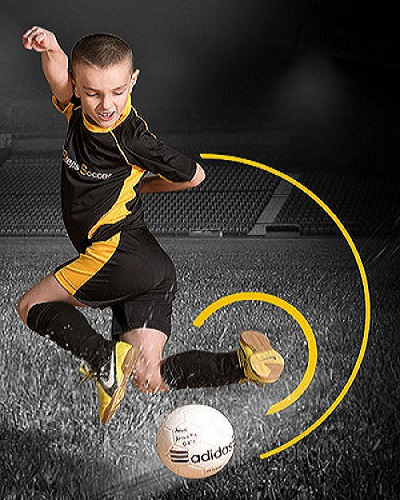 Child football coaching between the age of 2 and 9 is increasingly viewed by top football coaches and academics as the ‘golden window’ for skills development in players, as children are incredibly receptive to high quality coaching at a young age. These early years offer a tremendous opportunity for a child to build the foundations of skill and technique that will stand them in good stead for the rest of their sporting lives.